Christopher Wilson & Assoc. : An Elephant in the Room? Having followed the Ottawa Citizen throughout the summer, I have been surprised by the absence of what would appear to be one the bigger stories of the year, that is, if you consider civilization altering stories significant. According to Abdalla Salem El-Badri, Secretary General of OPEC, world demand for oil in 2030 is likely to increase 25% to 106 million bpd from 84.2 million bpd in 2009 (a demand estimate that was revised downwards from last year). At the same time Dr Fatih Birol, the chief economist at the respected and conservative International Energy Agency (IEA) in Paris, warns that production from existing oil wells is declining at a rate of 6.7% per year. If you do the math, then by 2030 today’s wells will be producing over 60 million bpd less. This demand-supply gap is huge -- potentially as large as the global total of this year’s oil consumption! Since 1984 oil production has continually surpassed new oil discovery. As a result, “even if demand remained steady, the world would have to find the equivalent of four Saudi Arabias to maintain production, and six Saudi Arabias if it is to keep up with the expected increase in demand between now and 2030,” cautioned Dr. Birol. As per the US Energy Information Administration (EIA), Saudi oil production was 11 million bpd in 2008 or approximately 10 times the amount of oil being produced from Alberta’s oilsands. The likelihood of suddenly finding six new Saudi Arabias worth of oil in the next few years and bringing them online at full capacity is “almost certainly impossible”, says the UK government’s All Party Parliamentary Group on Peak Oil (APPGOPO). The good news is that this demand for energy is likely to drive major global efforts towards the development of renewables and other alternative, clean energy sources. As a consequence, we could potentially see Canada’s contribution to GHGs and climate change reduced. However, experts like David Hughes of Canadian Geological Survey, suggest the scale of the energy required to replace oil is so large “renewable energy technologies cannot hope to fill the energy-demand void left by hydrocarbons,” especially in Canada given the minor position they currently hold, roughly 5% of our total energy supply. To facilitate an appreciation of the scale of oil energy being consumed annually around the world, consider 1 cubic mile of oil (cmo). At today's rates, oil consumption is approximately 1.3 cmo. One cubic mile of oil is the equivalent of any of the following operating for 50 years: 4 Three Gorges dams; or 104 coal fired electricity plants; or 32,850 wind turbines; or 52 nuclear power plants; or 91,250,000 solar panels. Alternatively, to completely replace 1 cmo with roof top solar panels, for instance, would require 4,562,500,000 panels at an estimated cost of $68 trillion and an area of 64,000 sq. km -- roughly the area of New Brunswick. The bad news is that this demand-supply gap is just as likely to trigger massive use of high intensity carbon-based energy such as coal-to-liquids, shale oil, oilsands, and ethanol – in fact anything we can get our hands on to burn. It is already evident that when the economy is hurting governments will ignore everything else, including climate change and environmental degradation, to ease the immediate economic pain of their citizens. Our own Canadian government is just getting used to the language of climate change and its commitment to it is untested. Should the economy once again falter, it is likely the government would do anything to alleviate concerns for economic stability, including massive federal infusions to the Alberta oilsands project, regardless of the climatic repercussions. Why can’t we just invest more money to find new oil and gas reserves and bring them online? Well in truth that’s what every energy company the world over has been trying to do. However, from a global perspective oil discovery peaked in 1965 and has been on a steady downward trend ever since. We’re using hydrocarbon energy far faster than we can pull it out of the ground. Canada, for instance, has been drilling for gas like crazy in recent years but our gas reserves have been on a steadily declining treadmill nonetheless. The most likely consequence of a supply shortfall will be the destruction of oil demand. 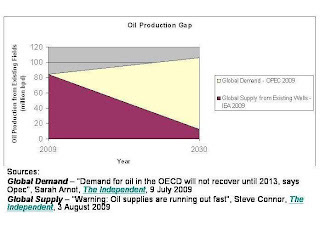 If demand greatly exceeds supply, then oil prices will go through the roof, even more so than they did in 2008. This will, of course, have ramifications on the costs of food, transportation, manufacturing, tourism, and just about every other area of economic activity. The global economy, which at the moment has been pumped up on the steroids of public bailouts, will once again stall from a lack of cheap energy. Given that just about every government in the world has just put itself in hoc for decades to try and climb out of the current recession, when the next decline hits, maybe within five years, there will be no money for bailouts and it is likely to be quite painful. It will also slow oil investment and further strangle the future flow of oil from new sources. However, any economic contraction will only partially dampen oil demand, as most of the demand growth is coming from increasingly prosperous and populous countries like Brazil, China and India. As these countries become more affluent, they naturally want the same energy consuming goods and services we have in Canada. We along with other western countries will be hard pressed to refuse them. If demand continues to grow and supply continues to contract as the IEA suggests, then at some point, the stage will be set for high prices, oil rationing or even major national conflicts over the remaining oil supplies. We can expect therefore crash programs around coal and oilsands. These will be the cheapest and quickest to undertake in the short term. Nuclear is too expensive, as the Ontario government concluded this summer, wind and solar just aren't scalable, and big hydro projects take too long to complete. Canada can expect intense pressure from its southern neighbour to rapidly ramp up oilsands production, no matter how much natural gas is re-directed from eastern Canadian homes in winter or how dry the Athabasca river becomes. And don't expect Russia to back down from any face-off in the Arctic when the absence of ice makes oil drilling there feasible. Control of oil and gas is real power, and the Russians have already demonstrated both their understanding of that power and their willingness to use it. Our economy, our food supply, our very civilization depends on access to vast amounts of energy which we have largely obtained from oil. The era of cheap oil and all that depends on cheap oil will soon be over. Just to reiterate, based on current IEA production estimates from existing wells, the supply gap will be larger than all the oil the world consumed in 2008. Think about it. Is it really rational to think that we can quickly develop a production capacity from new sources of oil or oil substitutes greater than today’s total – a capacity that took a century to put in place? Are we likely to find the trillions upon trillions of investment dollars needed? And can we do it in such an uncertain economy to boot? In Canada, there is a growing chorus of prominent voices warning of peak oil, people like David Hughes, Thomas Homer-Dixon, and Jeffrey Rubin, the former chief economist for the CIBC, but there remains an eerie silence from politicians of all stripes in Canada, as well as from the media on the subject. In contrast to climate change this seems like the elephant in the room. In the UK, it’s quite the opposite. The APPGOPO has recommended the Government put in place safeguards not only against energy price increases, but also against outright scarcity of fuels, while simultaneously creating an energy rationing system and reducing national dependence on fossil fuels. It also recommended that all these strategies be in place and be tested well in advance of energy shortages. Describing the need as “urgent”, “essential” and “non-negotiable”, the APPGOPO exhorted “Governments and other institutions to move beyond research and into development of effective frameworks to achieve a rapid phase-down in emissions, while reducing demand for fossil fuels and ensuring fair entitlements to energy as the economy moves into deepening energy scarcity.” Says Malcolm Wicks, the UK Prime Minister’s Special Representative on International Energy, “there is no room for complacency”. So why are we so complacent? What are our options and why aren’t we talking about this? If the probability exists that in the near term Canadians could not only be saddled with sky high oil and gas prices, but also with no oil and gas at all, then isn’t this topic worthy of national debate?